Films come and go ,but how many films come along and and once you have watched them stay with you for days purely because of their entertainment value . 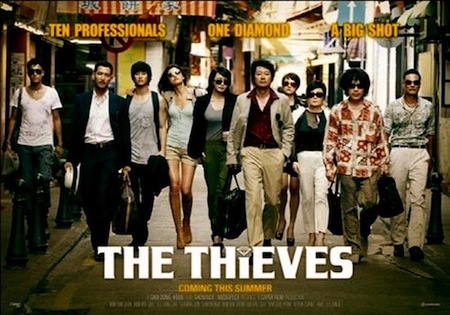 Well Korean caper comedy ''The Thieves '' is one such film. 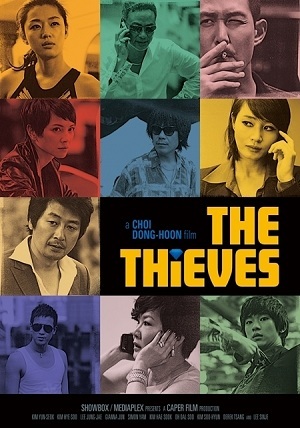 Directed by screenwriter and director Choi-Dong-Hun The Thieves is a film that's filmed in many exotic locations, like Korea,Hong Kong and Macau ,it's also a film that plays host not just Korean stars but also stars the likes of Simon Yam ,Angelica Lee and Derek Tsang from Hong Kong. Now Choi Dong-Hun is one of those new breed of Korean directors like Ryu Seung Wan who deliver high octane films which excite with complex stories. Now one of the reasons for this is the that Screenwriters make the best directors , directors come along and often get the it wrong by not understanding what the screenwriter has put forward. 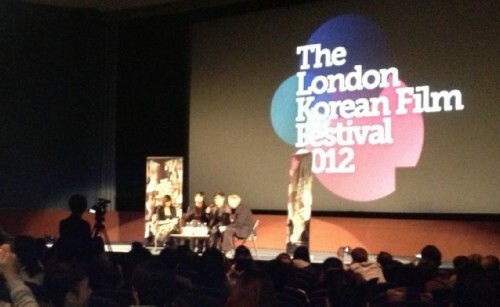 Choi Dong-Hun is a great screenwriter and this shows in his direction. Now the story of the Thieves surrounds that of a planned theft of a Diamond called the Tear of the Sun ,estimated to be worth $30'000'000. The Diamond which was on display in a exhibition in Japan and stolen by one Madame Tiffany , Now Madame Tiffany is coming to Macau to sell the diamond ,while she is there the Diamond will be kept in the vault of a big Casino. This is where Master thief Macau Park comes in ,he plans to put together a team to travel to Macau and steal the Diamond from Madame Tiffany and re-sell it on to one Wei Hong a ruthless gangster and also the partner of Madame Tiffany. 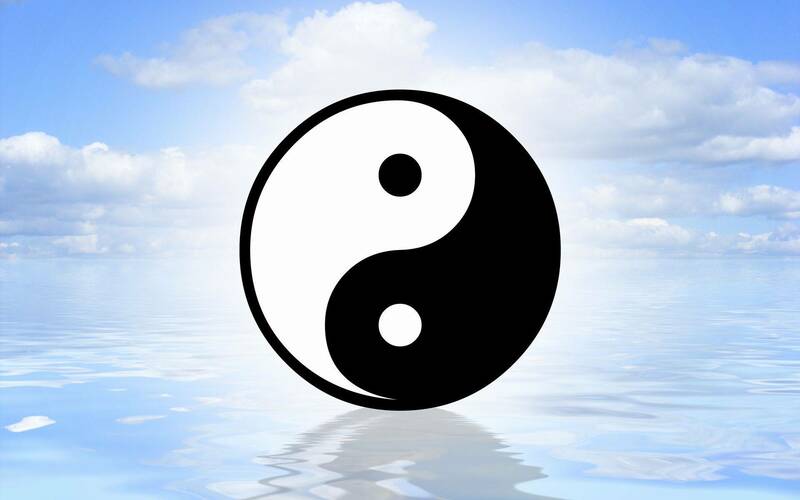 Thing is Wei Hong is often rarely seen and no one knows of his identity and most people that do see him wind up dead.. 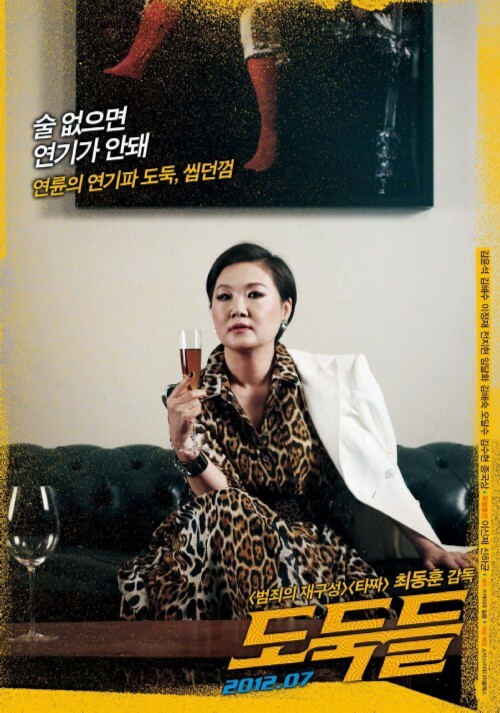 The Film initially starts in South Korea which is where we are introduced to Chewing Gum and Anycall a pair confident trickster style thieves who pose as mother and daughter to lure rich hopefuls to let there guard down take them for what they have. Now they don't work alone they have two guys helping them called Popeye (the leader) and Jampano ( the Technical man) , Thing is the teams latest scam has left a trail and the Police visit their den and what follows is a battle of wits as they try and cover up their ill deeds. Now Macau Park knows Popeye and his team ,though they have not worked together for some time , Macau plans to use the team to get the Diamond, he will also need help of fellow Chinese thief Chen (played by Simon Yam) and his two cohorts. Now Popeye knows he needs a safe cracker that can handle the pressure and he enlists the help of a young woman named Pepsee , having just been released from prison ,she could prove a liability and to top that she has a past with Macau Park which did not end on good terms. Yes I'm trying not to give to much away in this background pitch for the film , as it's one of those films you really have to see every moment of with out really knowing the full story to get full enjoyment out of. And enjoyment you will surely get . I suppose you could break up the film into three parts , first we have the coming together of the group ,their backgrounds and finding out about their traits. Secondly we have the planning of the robbery which is planned to precision and then the robbery and the finale. Each of these segments play slightly differently letting the viewer experience many emotions through out. You will surely laugh during the first part while the second section of the film will intrigue you . The ending of the film will have you on the edge of your seat as other players come into play as more and more people are involved in what is thought to be a simple robbery. Also the action is cranked up to a point of some quite severe violence at times which will shock as well as entertain. But what really makes the film work is the great writing and some of the finest actors and actresses to grace the screen . Kim Yeon Suk is cool and calm as Macau Park and exudes a on screen presence few actors can muster ,but the same also applies to Hong Kong legend Simon Yam who gives a sterling performance as Chen . Now the director Choi Dong-hun grew up watching Hong Kong action liked the films of Simon Yam, his wish was to someday work with Simon and his wish came true with The Thieves. Yes we loved The Thieves ,it is a refreshing piece of entertainment , and if any other person compares it to another caper movie from Hollywood with out thinking ,then they truly don't know films. If you need to compare the actors to any body else playing similar roles ,make sure your referring to Kim Yeon-Suk in reference to Frank Sinatra and Simon Yam to Dean Martin and not some other stars I care not to mention. OK we where lucky here at K.I.T.G. 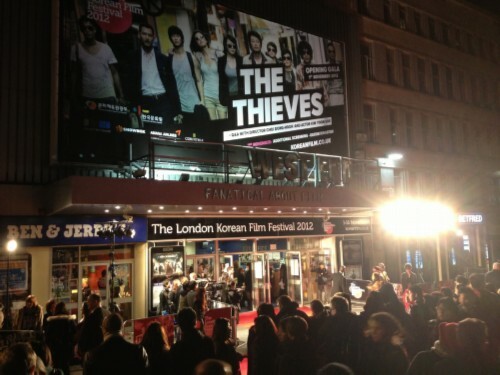 We got to see the film at the opening gala of the London Korean film festival with Director Choi Dong-hun and actor Kim Yeon -Suk in attendance ,but in the end the film rocked big time and the cinema was packed to the gills . If you see one crime caper movie this year then make sure it's The Thieves , in fact if you see any crime caper movie ,make sure you see The Thieves before anything else.